Please keep in mind that these airline announcement scripts can vary greatly according to the time of day, the length of the flight, the aircraft type, the origin and destination and of course, the airline. These texts are provided simply as a guidance. “Ladies and gentlemen, this is/my name is X and I’m your chief flight attendant. On behalf of (Captain Z and) the entire crew, welcome aboard ??? Airlines flight ?? ?, non-stop service from ??? to ??? (then continuing on to ???). Our flight time will be of ??? hours and ??? minutes. We will be flying at an altitude of ??? feet/meters at a ground speed of ??? miles per hour/kilometers per hour. “Now we request your full attention as the flight attendants demonstrate the safety features of this aircraft”. “When the seat belt sign illuminates, you must fasten your seat belt. Insert the metal fittings one into the other, and tighten by pulling on the loose end of the strap. To release your seat belt, lift the upper portion of the buckle. We suggest that you keep your seat belt fastened throughout the flight, as we may experience turbulence. There are several emergency exits on this aircraft (??? forward, ??? aft, and ??? over each wing.) Please take a few moments now to locate your nearest exit. In some cases, your nearest exit may be behind you. If we need to evacuate the aircraft, floor-level lighting will guide you towards the exit. Doors can be opened by moving the handle in the direction of the arrow. Each door is equipped with an inflatable slide which may also be detached and used as a life raft. At this time, your portable electronic devices must be set to ‘airplane’ mode until an announcement is made upon arrival. We remind you that this is a non-smoking flight. Tampering with, disabling, or destroying the smoke detectors located in the lavatories is prohibited by law. Within a minute after take-off, an announcement may be made reminding passengers to keep their seat belts fastened. “Ladies and gentlemen, the Captain has turned off the Fasten Seat Belt sign, and you may now move around the cabin. 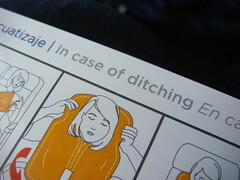 However we always recommend to keep your seat belt fastened while you’re seated. Occasionally, turbulence may occur during a flight. The seat belt sign will turn on and, in case of moderate to severe turbulence ahead, the flight crew will make a brief announcement. Shortly after the seat belt sign illuminates, this announcement will be made. To indicate the landing clearance or final approach, the Captain will either make the following announcement and/or blink the No Smoking sign. It may be followed by an announcement by a flight attendant. “Ladies and gentlemen, welcome to ??? Airport. Local time is ??? and the temperature is ???. Please check around your seat for any personal belongings you may have brought on board with you and please use caution when opening the overhead bins, as heavy articles may have shifted around during the flight. If you require deplaning assistance, please remain in your seat until all other passengers have deplaned. One of our crew members will then be pleased to assist you. This was so fun to try. I am a flight attendant and this made my speaking so much better.